The newest issue of Through the Needle ONLINE is out! This issue features easy-to-embellish guest towels to jump start your holiday sewing, adorable gift boxes for small treasures, instructions for cutting and stitching appliqued quilt blocks using your embroidery machine, a recipe for embroidered and bleached jeans, a fleece blanket bordered with spiraling alphabets, and an elegant jacket embellished with beautiful flowers. Click here to view Through the Needle ONLINE #8. Click here to download Through the Needle ONLINE #8 as a PDF file. Visit www.ThroughTheNeedle.com to subscribe to our Through the Needle ONLINE mailing list. 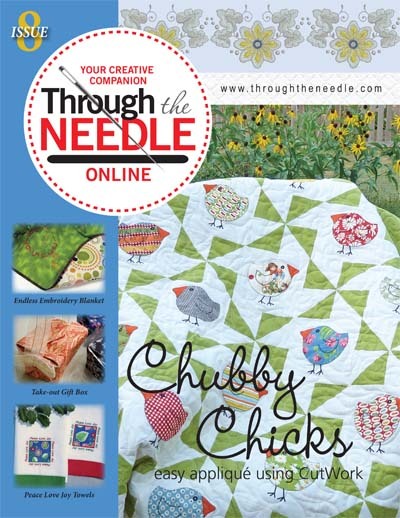 You’ll also find archived issues of Through the Needle ONLINE, containing even more sewing, quilting, and crafting projects. Share your love for sewing with this badge – post it on your website, blog, and facebook page! Looking for a wine bottle tote pattern. I was just searching for ideas for some little treasure and gift boxes. Surely, I’ll decorate some using my collage ideas, but I want to do something different this year.